WHAT: We’re upping your commission to 10%, and when you make a sale (just one!) over $75, you’ll receive a Stio t-shirt. Shirt specifics will be determined at the conclusion of the contest, dependent on the number of qualifying affiliates. We’re hoping to be able to give you your choice of shirt up to a $30 value – check out the men’s page here, and women’s here for an idea of what your shirt could look like. Shirts will be sent out at the conclusion of the contest. Additionally, for every sale referred during the contest you will receive an entry into a drawing for a $150 Stio gift card. You’ll also be able to sign up for Stio’s pro program, which will make $150 stretch pretty far! HOW: Any way you’d like! 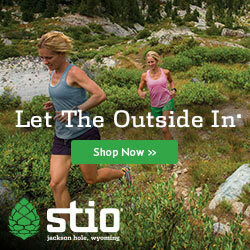 Have some Stio gear that you’ve been waiting to review? Now’s the time! Already posted a review? Nothing wrong with reminding your community of your favorite gear through a quick social media post or blog entry. We also have a few new banner sets that you could add to your site. These can be accessed through your AvantLink account. If you need other ideas don’t hesitate to reach out. If you are not yet a Stio affiliate but are active in AvantLink, CLICK HERE to login and apply. If you are not yet in AvantLink, and own a site dedicated to the mountain lifestyle: CLICK HERE.